Red light, green light, have you ever played that childhood game? In my childhood I cannot tell you how many endless hours that I spent playing this simple game with my friends at ice skating lessons. If you don’t know what the point of the game is, it is to be the first one to race to a designated line and someone specifically is the stop light calling out if the light is red, yellow, or green. Well, if you live in America you have encountered a stop light. But, equally, if you are a Christian you have encountered a green, red, and yellow light. You don’t get into a car to stay in the exact same place that you are now. You start a car to go somewhere. In my short life I have never seen a car that is put into drive and it not go anywhere. It is going to go. But it’s how it is operated that makes a difference between you crashing or going on a road trip. If you are on the road and encounter a road light, how good is that light going to be if you don’t move when that green light changes from red? Also, think of the dangers of running a red light. Your insurance will not have mercy on you. That road light is there for your protection. In this life, this world is not our home, we are just traveling through. Sometimes in my own life He gives me green lights to help others, accomplish personal goals, and most importantly build His kingdom, but I’m not always willing to take that leap of faith. I confuse my own desires labeling them as, “The will of G-d.” But to a degree a lot of Christians do this too. I, and so many others, will see a red light and try to use it as a green one and then blame G-d when we fail. When from the beginning it is not what He wanted us to pursue. If you are driving on a busy road what is it going to be like if you don’t follow any of the rules of the road? Then again, how is your life going to be if you don’t follow the rules and laws that G-d has given us? 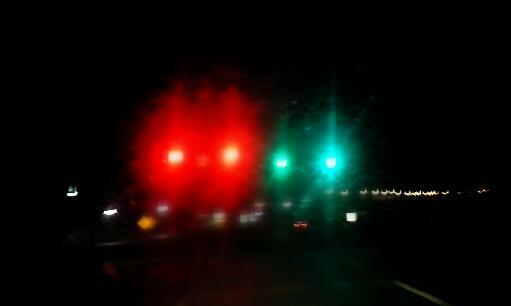 Are you following the spirtual green, yellow, and red lights as G-d wants us to? Or are you letting G-d guide your car?